All of my Resonator Guitars are hand crafted and made with solid wood. I have been collecting wood for the past few decades and have some of the finest tone woods in stock. Clinesmith Resonator Guitars are available in 6,7 and 8 string options. My guitars are built using a large body size, which is deeper and slightly longer than the traditional sized resonators from the 80's and earlier. I use a unique post and baffle construction, instead of the traditional "soundwell" design. The brace and post system I use opens up the instrument, to use the body as well as the resonator. Where my baffle system optimizes projection and eliminates unnecessary overtones . This along with the body size and specific wood thickness' contribute to the sound. Producing a well balanced guitar with superior volume, bass and treble response with a voice that grows as the instrument ages. The use of solid woods contribute greatly to the sound of the instrument. Below are some descriptions and prices of tone woods I most commonly use. I am a custom builder , so if you do not see a wood type or option you are looking for , please check with me as I have many other wood types in stock, and many options available to making a custom built instrument. 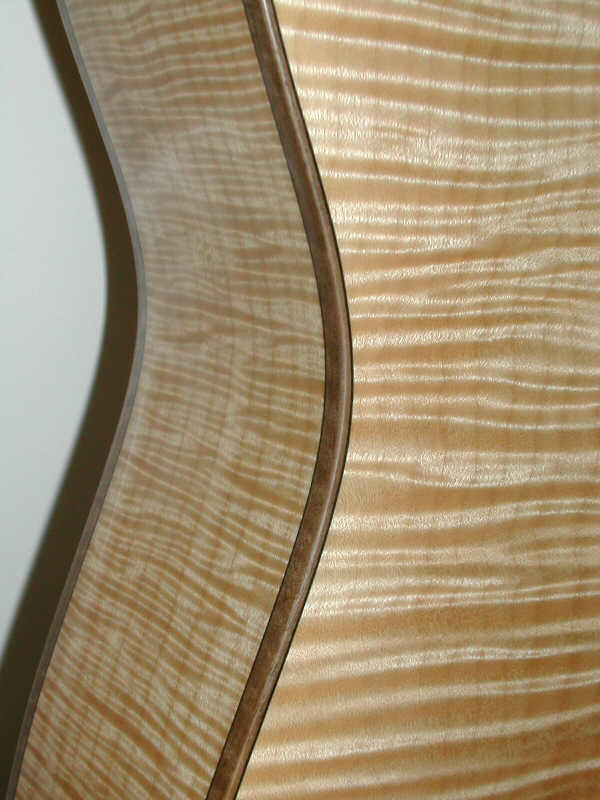 Curly Maple is one of my favorite tone woods for Resonator Guitars, especially in a bluegrass setting. It's bright,punchy, well balanced with good high , and bass end response with tight mids.It cuts through other instruments in a band situation. The Maple I use has a tiger stripe or fiddle back figure. I offer this in a blonde finish , Deep Red ,, Cinnamon and Tobacco sunburst finishes. Hawaiian Koa is one of my favorite woods to work with. It is beautiful, finishes out nicely and has great tone..For a tone wood it is mellow and warm, but still projects well with a crisp high end. I have some amazing boards that I have been turning into beautiful guitars for the past several years. I like to use an Oil finish on my Koa guitars but also use traditional lacquer when requested. Wood bindings also contrast nicely with this wood. Honduran Mahogany has been making fantastic musical instruments for years. 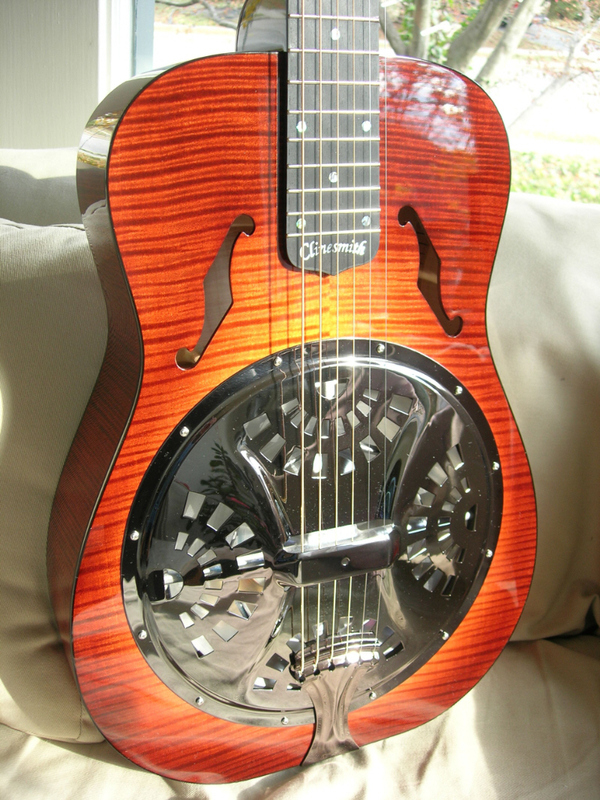 It is a stable, and dense wood that contribute to a warm and lively resonator guitar. I have a large supply of Honduran Mahogany that came out of a Veneer mill assembly line in the 40's. The wood is perfectly quartersawn and is of the finest example of Mahogany for acoustic instruments. Rosewood makes for a great sounding resonator guitar . It makes for a warm but very rich instrument, with a clear high end and a tight mid range, when matched with a Spruce top. I have a small supply of Madagascar Rosewood that makes a beautiul instrument that compares favorably with Brazilian Rosewood in beauty and tone. I have a few sets of Brazilian Rosewood in stock. This will be the last of this endangered wood I will will work with.. If you are interested in this wood please email for availability and prices. Oregon Myrtlewood or California Laurel grows in a very small region from Northern California to Southern Oregon with in the coastal influenced mountains. It can make a fantastic tone wood that is comparable to Maple in response and tonal characteristics. The right piece can be as beautiful as Hawaiian Koa, as it has tight figure and has remarkable color variations with dark streaks. No piece is the same. Living in Oregon I have found some excellent examples of this wood.